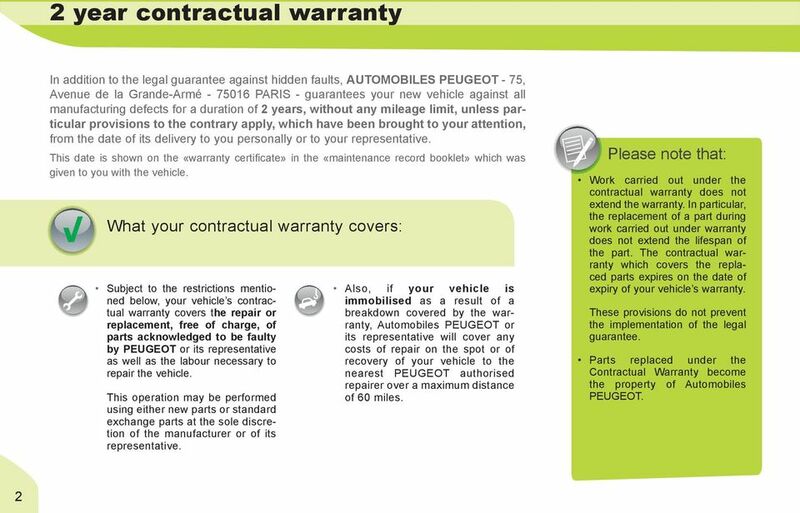 Download "Your PEUGEOT vehicle s Warranties at a glance"
4 2 year contractual warranty What you must do in order to benefit fully from the contractual warranty Present your vehicle s up-to-date «maintenance record booklet», including the warranty certificate in particular, duly completed by the dealership which sold the vehicle. Have the vehicle maintained and serviced in strict conformity with PEUGEOT s instructions and is able to provide proof of this (maintenance records, invoices, etc.). As soon as any fault is detected, your vehicle must be presented to the approved repairer of the PEUGEOT marque for repair during normal opening hours. The aim of this precaution is to ensure your safety and that of your passengers as well as to prevent any aggravation of the fault observed which could result in more extensive repairs than those required at the outset. For this reason, the contractual guarantee does not cover the fault and its consequences if you did not act immediately after the said fault was detected. You must also accept any invitation from an approved repairer of the marque to have your vehicle repaired immediately. Non-compliance with these rules would render you responsible for any consequence, direct or indirect, that might arise concerning the correct operation of your vehicle. 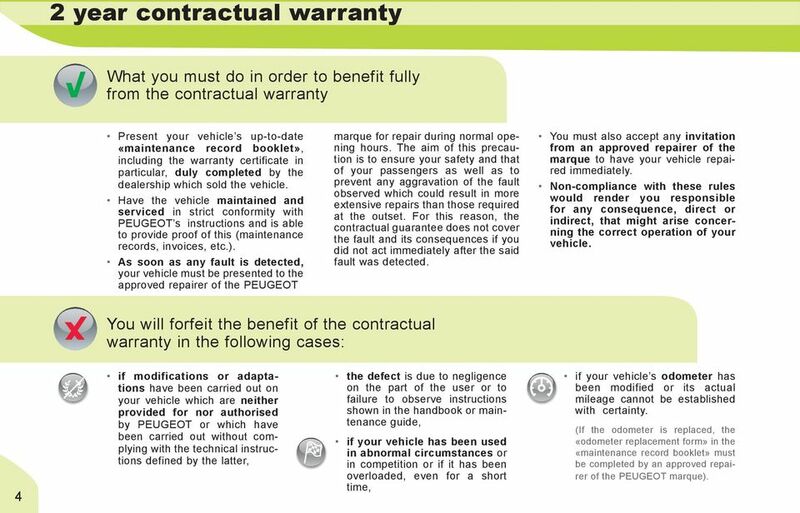 You will forfeit the benefit of the contractual warranty in the following cases: 4 if modifications or adaptations have been carried out on your vehicle which are neither provided for nor authorised by PEUGEOT or which have been carried out without complying with the technical instructions defined by the latter, the defect is due to negligence on the part of the user or to failure to observe instructions shown in the handbook or maintenance guide, if your vehicle has been used in abnormal circumstances or in competition or if it has been overloaded, even for a short time, if your vehicle s odometer has been modified or its actual mileage cannot be established with certainty. (If the odometer is replaced, the «odometer replacement form» in the «maintenance record booklet» must be completed by an approved repairer of the PEUGEOT marque). 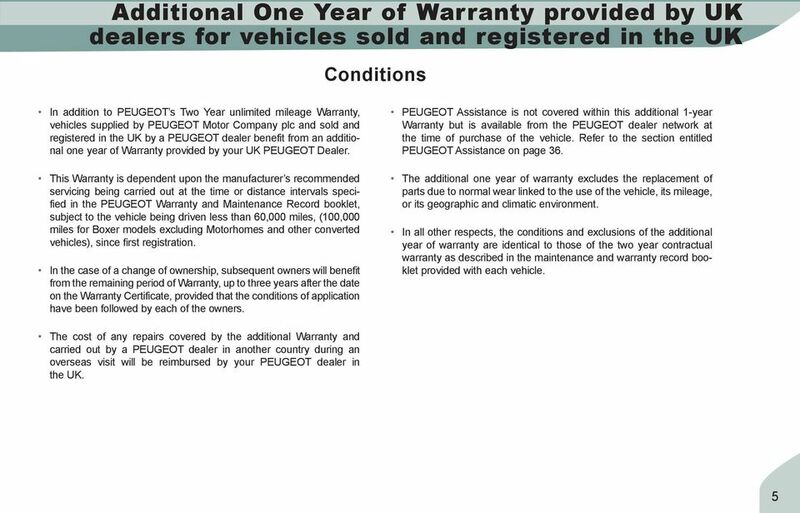 7 Anti-Perforation Warranty PEUGEOT guarantees your vehicle against perforation (corrosion from the inside towards the outside of the bodywork) from the date of delivery shown on the «warranty certificate» in the «maintenance record booklet» for a duration of: - 12 years in the case of a private vehicle, - 5 years in the case of a utility vehicle. 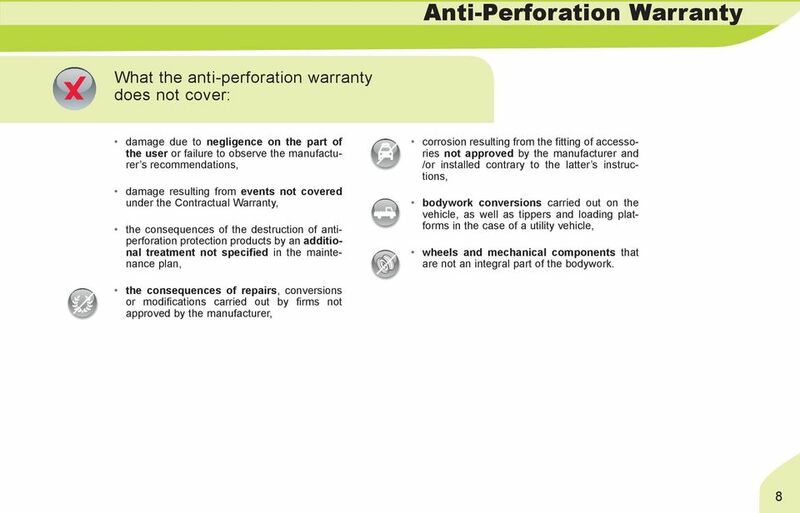 7 What your anti-perforation warranty covers: The anti-perforation warranty covers the repair or replacement of components acknowledged to be faulty by PEUGEOT or its representative, on which a perforation due to corrosion appears. The Anti-Perforation Warranty is applicable subject to the express condition that the vehicle has at all times been repaired in strict accordance with the manufacturer s standards and that the client has had carried out in good time: 1) periodic servicing mentioned in the Maintenance record booklet, 2) the anti-perforation warranty inspections presented below, and 3) work to repair damage to the vehicle, if any. 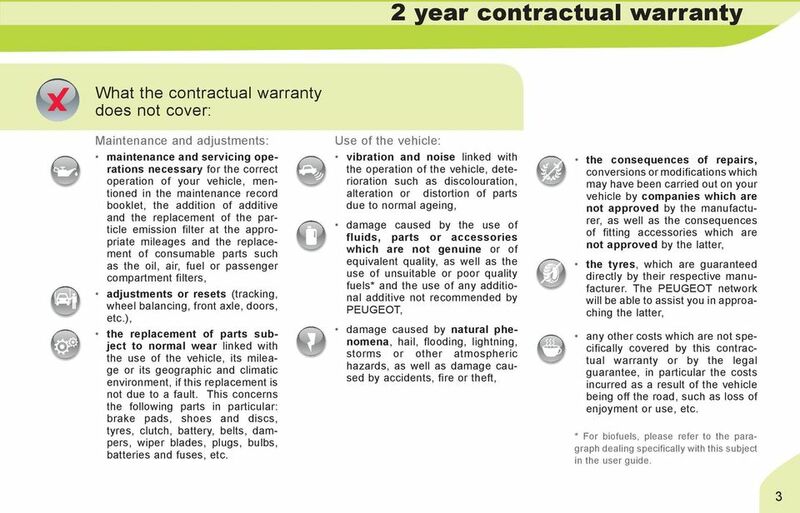 The Anti-Perforation Warranty maintenance cycle stipulates four periodic inspections, payable by the user, to be carried out without fail 4 years after the date of commencement of the Anti-Perforation Warranty for private cars or 2 years after this date for commercial vehicles, and thereafter every 2 years for all vehicles. 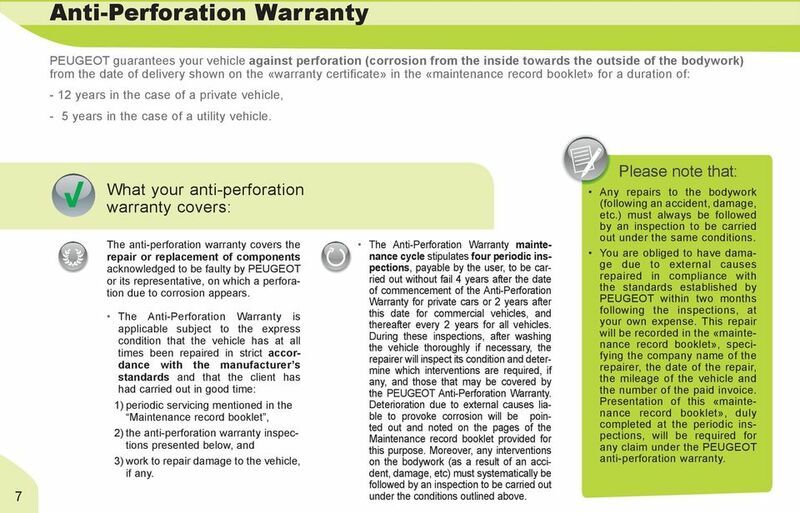 During these inspections, after washing the vehicle thoroughly if necessary, the repairer will inspect its condition and determine which interventions are required, if any, and those that may be covered by the PEUGEOT Anti-Perforation Warranty. Deterioration due to external causes liable to provoke corrosion will be pointed out and noted on the pages of the Maintenance record booklet provided for this purpose. Moreover, any interventions on the bodywork (as a result of an accident, damage, etc) must systematically be followed by an inspection to be carried out under the conditions outlined above. Please note that: Any repairs to the bodywork (following an accident, damage, etc.) must always be followed by an inspection to be carried out under the same conditions. 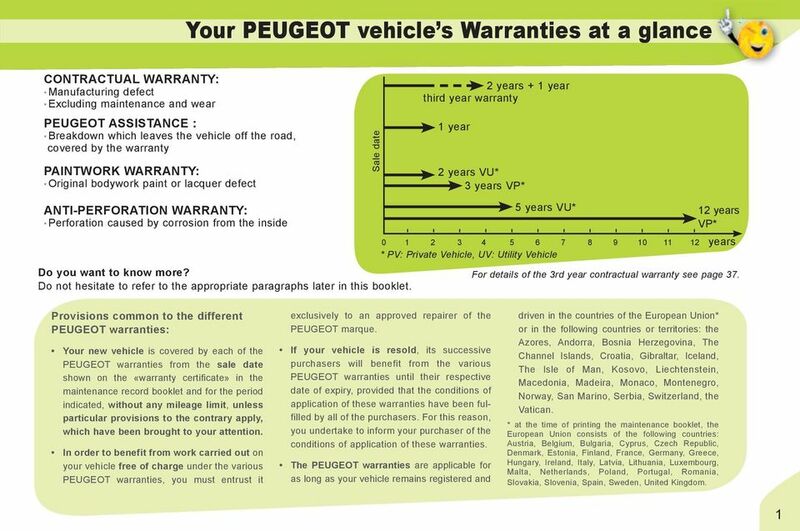 You are obliged to have damage due to external causes repaired in compliance with the standards established by PEUGEOT within two months following the inspections, at your own expense. This repair will be recorded in the «maintenance record booklet», specifying the company name of the repairer, the date of the repair, the mileage of the vehicle and the number of the paid invoice. 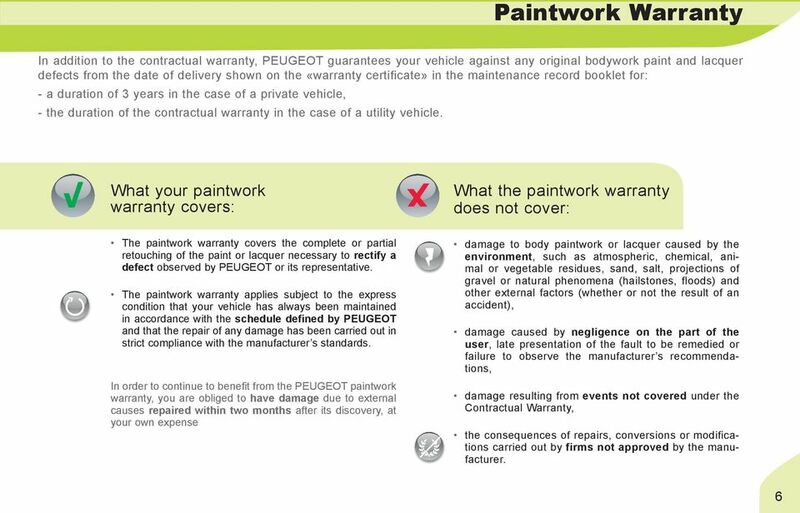 Presentation of this «maintenance record booklet», duly completed at the periodic inspections, will be required for any claim under the PEUGEOT anti-perforation warranty. About us. As our customer you will be able to take advantage of the following benefits: One Provider. Flexible Billing. Our Portal. BSR Innovation Express: Cluster- to- Cluster Conference Funding and network opportunities for cluster internationalization Jens Peter Vittrup Special Adviser Email: jpv@ai.dk Why international R&I cooperation? 4) Prosecution Within six months of the date of publication of the application, an "Examination Request" must be filed and an examination fee paid. 1.7 A film that has been submitted during a previous edition, won t be accepted. 1.2. The RAD Data Protection Policy and Procedures is part of the RAD s overall Information Strategy. Lowestoft College and Company FE Fee and Refund Policy for the Academic Year 2015/16 This Policy is available in alternative formats; please contact the College s Human Resources Team for further information. Our patent and trade mark attorneys are here to help you protect and profit from your ideas, making sure they re working every bit as hard as you do.